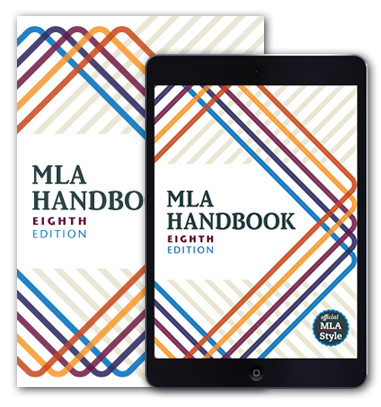 The eighth edition of the MLA Handbook introduces a new model for entries in the works-cited list, one that reflects recent changes in how works are published and consulted. Previously, a writer created an entry by following the MLA’s instructions for the source’s publication format (book, DVD, Web page, etc.). That approach has become impractical today, since publication formats are often combined (a song listened to online, for example, could have been taken from a record album released decades ago) or are undefinable. In the new model, then, the writer asks, “Who is the author? What is the title?” and so forth—regardless of the nature of the source. Because of this fundamental change, the works-cited-list entries produced by the two approaches are different. Below are differences that might be overlooked by writers making the transition from the seventh edition. Common terms in the works-cited list like editor, edited by, translator, and review of are no longer abbreviated. The eighth edition provides a shorter list of recommended abbreviations (96–97). Page numbers in the works-cited list (but not in in-text citations) are now preceded by p. or pp. (46). For books, the city of publication is no longer given, except in special situations (51). Issues of scholarly journals are now identified with, for instance, “vol. 64, no. 1” rather than “64.1” (39–40). If an issue of a scholarly journal is dated with a month or season, the month or season is now always cited along with the year (45). The URL (without http:// or https://) is now normally given for a Web source. Angle brackets are not used around it (48, 110). The citing of DOIs (digital object identifiers) is encouraged (110). Citing the date when an online work was consulted is now optional (53). Placeholders for unknown information like n.d. (“no date”) are no longer used. If facts missing from a work are available in a reliable external resource, they are cited in square brackets (2.6.1). Otherwise, they are simply omitted. A forward slash (/) now separates the names of copublishers (108). When an organization is both author and publisher of a work, the organization’s name is now given only once, usually as the publisher (25). No author is stated. Full publication information is now given for widely used reference works. Page-number spans are given for articles in alphabetically arranged reference books in print. In other words, reference works are treated like other works and are no longer subject to exceptions. The medium of publication is no longer stated, except when it is needed for clarity (52). For time-based media like video, times are now cited in the text (57). The use of my trans. to identify the writer’s translation of a non-English quotation is described (90–91). How to shorten long titles when they have to be included in a parenthetical citation is clarified (117–18). The common practice of documenting borrowings from Greek, Roman, and medieval works with part numbers, not page numbers alone, is described (122). The punctuation used when various items are combined in one parenthetical citation is summarized (126–27). Ways of formatting citations in research projects other than traditional papers are suggested (127–28). When the title of a periodical (journal, magazine, newspaper) begins with an article (A, An, The), the article is now treated as part of the title: the article is italicized and its first letter capitalized. For example, the handbook previously specified “the Georgia Review” in text and “Georgia Review” in the works-cited list but now specifies “The Georgia Review” in all contexts. For works in a language not written in the Latin alphabet, writers must choose between giving titles and quotations in romanization or in the language’s writing system (74, 91). Two forward slashes (//) mark stanza breaks in run-in quotations of verse (78). If a block quotation of prose contains internal paragraphing, the first line of the quotation now begins without a paragraph indention even if one is present in the source (77).